There is a big stink these days about the languishing of earnestness. The irony epidemic is upon us, say the nay-sayers, as is the slow atrophying of the young people’s will to empathize and take much seriously. David Denby tried his hand at nailing a pamphlet to a church door with his inscrutable, overwrought Snark, and R. Jay McGill Jr. got his 500-year history about sincerity flying off the shelves. Regardless of the anecdotal evidence, the ever-pervasive dread about the subsequent generation’s flagrant narcissism – which is really grand talk coming from the (shudder) Baby Boomers – that has existed since the beginning of time is once again wasting space in the cultural conversation. Unlike many, I am willing to acknowledge that I do not have a bird’s-eye view on the moral compass of an entire generation. I do not have an Alethiometer from a Philip Pullman universe that can gauge the true nature of men’s hearts, that can parse out the wounded idealist under the stoic cynic en masse. I doubt that aloofness and earnestness are distinctly opposed, and that the landscape between the two can be summed up in such a reductive and binary way. Perhaps irony and sincerity stem from and feed each other; perhaps the ironic comment does not preclude a mean, ironic heart. Or, more obviously, perhaps we’re using the word irony all wrong. Perhaps the very act of living itself is, despite everything, an act of utter earnestness. But under the hand-wringing of the Baby Boomers about the next generation’s inability to really connect with the plight of others – which probably stems from a selfish anxiety that we will put them in homes or cut their Social Security – is an evaluation of our own generation that viciously critiques itself. The giant, bulbous pus-sack of the Internet self-flagellates and denigrates its “hipsters,” a now utterly vacuous and meaningless term that has devolved into meaning anybody that exercises the minutest semblance of discernment in how they consume popular culture. Meaning everybody. I am utterly unable to reconcile the diagnosis of the oblivion of sincerity with the seemingly more endemic onslaught of self-awareness. Sincerity is not the absence of self-awareness by any means, and I think earnestness and kindness can stem from that kind of reflective nature. It can even branch out of a preoccupation or self-obsession with one’s own conduct in relation to others. Sometimes that kind of selfishness has a sweeter taste to it than kindness that is enforced by decorum or propriety, as just about any 19th-century English novel we were forced to read will tell us at length. And I mean at length. I mention all of this only because sometimes a work comes along that demonstrates, in part, how empathy can be found in a self-occupied grandiosity, and places of almost unbearable self-consciousness. This is really the quest of Cloud Atlas, as a novel and as a book. This novel and film are the strongest evidence that even out of self-aware handwringing comes this wonderfully convincing understanding and sympathy for others. In the novel, David Mitchell takes six stories and inhabits their genres and voices so proficiently that it is equivalent to a virtuosic literary form of Method acting. These voices span centuries, and take on the accurately portrayed English language of yesteryear, but also a reasonably deconstructed, post-apocalyptic perversion of the language. The book laces these stories together – a little tenuously at times, and definitely with an ironic wink here and there – but their struggles, under all the pomp and artifice of such an ambitious and conceited novel, are remarkably human. This, in part, comes through a lot stronger in the film. Cloud Atlas mires itself in the typically human, admittedly banal struggles of literature and cinema: a journalist uncovering a devilish corporate scheme that sacrifices the welfare of the public on the altar of profit; the struggle for survival of the ‘good ones’ against a roving tribe of cannibals; and the pratfalls of muted desires and unrequited love. These stories are set across vastly disparate times and time zones: from Europe to Asia to the middle of the Pacific Ocean. They are also deliberately placed within very specific formats in both the book and the film: the story of a clone is heavily informed by the sci-fi tropes of Blade Runner; the post-apocalyptic story and speech are purposefully gritty. What is new about the genre exercise, and is it fair to say they are new simply by force of juxtaposition? Are six somewhat familiar stories scrambled up and spliced together as such allowed to be called unfamiliar just because one film bounces between them? The extra dimension, here, is how the stories are connected, but this seems too obvious an answer, and is the primary problem of both book and film. The book connects these stories oftentimes in a groan-inducing cop-out wherein one person’s story is simply a fictional manuscript read by another, or the seed by which a movie script germinates. 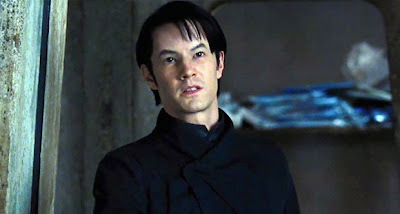 If Cloud Atlas intends to posit that our souls are interconnected, or inextricably linked by indomitable forces, it ought to have done a better job making a case for the interconnectedness by aiming for a much more concrete connection. That the connections are so shoddy does not bode well. Ultimately, the book gets bogged down in New Age-y theories about spiritual ancestry and the inheritance of souls, and this flirts too much with cosmic unknowns for me, especially since the phenomenon of interconnectedness is very beautiful and satisfying to point out within strictly secular contexts. The film reinforces this recurrence of souls by casting Tom Hanks everywhere, and even putting white actors in Asian roles (and letting them don make-up that just begs for, and ultimately received, racially-based consternation). It also panders to the lowest-common denominator by giving everybody a shooting-star birthmark which is put into focus mostly to demonstrate that the studio might not trust the audience with such a lofty and unmarketable premise. Cloud Atlas is ambitious, serious, and demands engagement from the audience with its material. This often gets reduced to the lovely and sometimes misappropriate word “pretentious,” which has now come to mean any form of self-importance, even the kind of self-importance it takes to get up in the morning and go to work. It is long, it is packed with stories, it is commenting on separate genres of fiction, experimenting with literary devices, connecting them in the most post-modern and abstract of ways, and making a statement about the evolution of voice and language over five-hundred or so years. It is political in its implications about the future of global society. This is a book and movie that should, on all signs, not seem at all engaged with the humanity of its characters. Such experimentation usually comes at the expense of empathy, not with its blessing. The epic scope and grandiosity – its macro-scale analysis of fiction and genre together – seems like such a grand, big-scheme comment on the flow of things that the specificity of its characters would get lost in the shuffle, but it does not. "The lovelorn, the cry-for-helpers, all mawkish tragedians who give suicide a bad name are the idiots who rush it, like amateur conductors. A true suicide is a paced, disciplined certainty. People pontificate, 'Suicide is selfishness.' Career churchmen like Pater go a step further and call it a cowardly assault on the living. Oafs argue this specious line for varying reasons: to evade fingers of blame, to impress one's audience with one's mental fiber, to vent anger, or just because one lacks the necessary suffering to sympathize. Cowardice is nothing to do with it - suicide takes considerable courage. Japanese have the right idea. No, what's selfish is to demand another to endure an intolerable existence, just to spare families, friends, and enemies a bit of soul-searching. The only selfishness lies in ruining strangers' days by forcing 'em to witness a grotesqueness." I agree, but that is hardly the point. The point is that Cloud Atlas deigns to rescue one of the most brutally stigmatized acts from the unjust throes placed upon it. It’s an immense relief that someone is willing to examine the humanity of such a drastic measure from the perspective of what it means to the perpetrator, not just how it pulls his or her companions out of complacency. 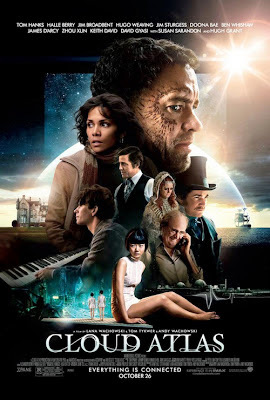 Regardless of my quibbles about how poorly American culture handles or processes self-annihilation, the major point is that Cloud Atlas breaks through what many see as a grandiose and theatrical gesture, finds a kernel of deep human connection, and empathizes in earnest. These feelings and thoughts seem to spring from a place deep within, all the while maintaining that grandiosity. This attitude is indicative of both the film and the book in their entire. It seems it is possible to have self-aggrandizement and the recognition of others’ humanity wedded. It seems one can carry a critical distance evaluating its source material and simultaneously hold a sincere love for the material’s inhabitants. Once again, the “A vs. B” binary mode by which mankind filters just about any two things that coexist - whether it be two colleges in a town, two teams on a field, two parties in a Congress, or two late-night talk shows on TV – devolves into arbitrary and pathetic competition. Things are not that simple. These binaries and variances are all interconnected and interdependent. It all goes beyond yin and yang, or even life and death. 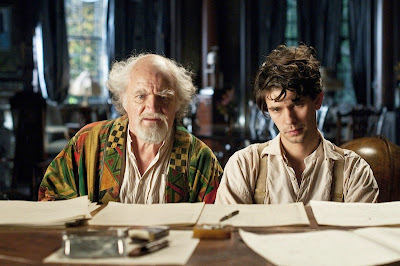 Cloud Atlas does not happen in twos - it happens in six.